This Healthy Slow Cooker Spinach Artichoke Dip can be made in a slow cooker or in the oven and this sounds perfect for a holiday appetizer. Click here to see The Best Slow Cooker Dip Recipes for Parties and Holidays. For Friday Favorites we spotlight past recipes that you may have missed, and don’t you agree that this Healthy Slow Cooker Spinach Artichoke Dip from The Yummy Life looks amazing, and it’s perfect for a holiday party. Get out your slow cooker and make this warm and creamy dip that’s such a yummy idea for an appetizer! This recipe can be doubled if you’re having a large crowd and believe me everyone will love it. The recipe is also low in carbs if served with veggie dippers, and it’s South Beach Diet friendly as well. Happy Holiday cooking to everyone; I hope your holidays will be great whatever you may be doing! 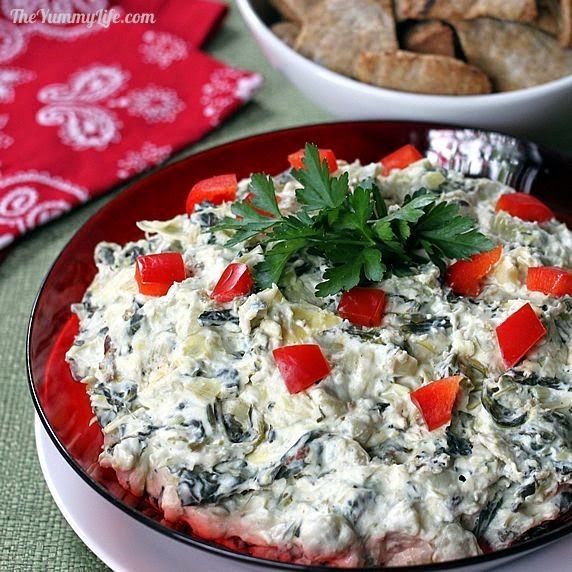 Get the complete recipe for Healthy Slow Cooker Spinach Artichoke Dip from The Yummy Life. Use the Index Page for Appetizers and Snacks to see all the slow cooker or pressure cooker appetizer recipes that have been featured on this site. I keep looking for a recipe to justify adding a very small slow cooker to my growing collection. This might be it! Lydia, I have a 1.5 quart one that's perfect for dips! You can never have too many slow cookers, that's my theory. I love my small crock pot, it's prefect for dips at parties and family get-togethers. I may have to try this one for New Year's Eve – most artichoke spinach dips call for mayo, of which I am not a fan. Debbie, hope you enjoy it. I need to use my small crock pot more.